This past weekend I had a baby shower for my cousin and his wife and they're expecting their first baby. My cousin is a very talented cartoon artist and his company's name is "Fly By Knight Designs". As long as I can remember he has been obsessed with bugs especially flies. I don't know why exactly but I do remember a few Christmas's ago he brought a fly that had tinsel attached to it and it flew around the room. 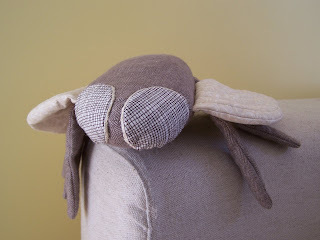 So instead of a cuddly teddy bear or bunny for the baby in honor of my cousin I made a lovable stuffed fly. 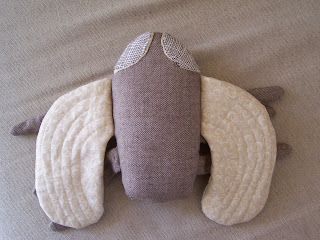 Though I seem to think the fly will be sleeping with my cousin at night instead of the baby. Oh Wow! That is so cute!! I love the fabric you used for its eyes!